Congratulations on your decision to connect with the Higher Realms! Your angels are here with you right now, assisting and supporting you on your journey. You have a team of divine light beings in the heavenly realms working on your behalf to assist you in all earthly endeavors. Your spiritual support team loves you unconditionally. Expect a Miracle, stay centered in love, and keep the vibrations of unlimited potential open. You are NEVER alone. You are so LOVED. Remember Who You Are. Use the shorter meditation of 15 minutes daily for 40 days and the hour meditation when you have the time. 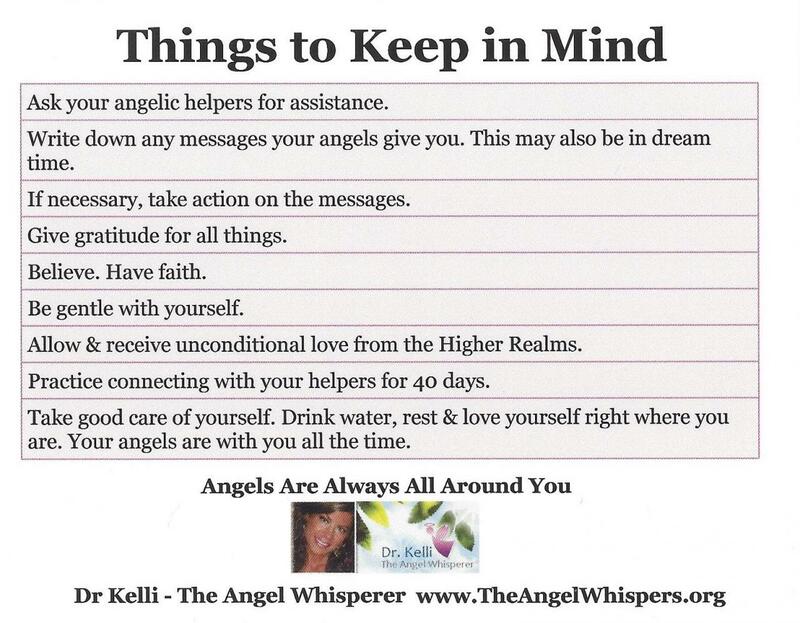 Dr Kelli – The Angel Whisperer takes you on a short meditative journey of calm. Keep your vibrations filled with radiant sparkles from the Higher Angelic Realms. Enjoy this experience as the angels open your heart to their infinite love. Be in a place where you can tune into your heart and let all cares dissolve with the radiance of the Higher Realms of Divine infinite Love, Light and Oneness. If you would like to set an intention before the meditation to focus on one area in particular, you may do so. You may light a candle and ask the angels to surround you in a circle of God’s love as you receive these healing vibrations. Allow love to stream forth. You are love. Feel the Higher Realms LOVE for you; their infinite eternal love for you. The angels will continue to work with you after the meditation is over. Be gentle with yourself and allow God’s infinite love to cradle you in truth. Now relax, let go into the arms of the angels love. Please do not listen to meditation while driving or operating heavy machinery.